With all of the footage for Labyrinth in the can by early September, the fall of 1985 was time to edit the film and re-record various audio tracks. In November, George Lucas came to New York to work with Jim in the editing room and both David Bowie and Jennifer Connelly came to the city to re-record (loop) some dialogue. Back in London the following month, some Hoggle action was re-shot and Brian Henson looped more audio. Work on the film’s sound and opening titles continued into the new year, and by March 14th, it was ready for a sneak preview in San Francisco. Learn more about casting Jennifer Connelly for Labyrinth. 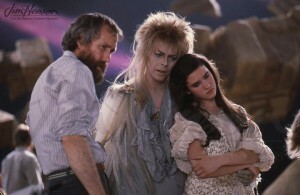 Jim, David Bowie, and Jennifer Connelly on the set of Labyrinth. 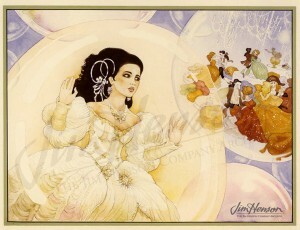 Sarah, as illustrated by Bruce McNally for the Labyrinth storybook. This entry was posted in 11-November '85, 1985, Labyrinth and tagged Brian Henson, David Bowie, George Lucas, Hoggle, Jennifer Connelly, Labyrinth, London, San Francisco. Bookmark the permalink.